St. Francis Xavier was born in the Kingdom of Navarre. He was born to an aristocratic family of the Kingdom, and the youngest son of Juan, a counselor to King John III of Navarre, and Dona, sole heiress of two noble Navarrese families. In 1512, King Ferdinand of Spain invaded the Kingdom of Navarre. Three years later Francis’s father died when Francis was only nine. In 1516, after a failed attempt to expel the Spanish invaders from the Kingdom, the Spanish invaders ordered the family lands to be confiscated, demolition of the outer wall, the gates and two towers of the family castle torn down, and the moat was filled in. Only the family residence inside the castle was left. For the following years with his family until he left for his studies in Paris, life in Navarre – partially occupied with Spain, was surrounded with war that lasted over 18 years. It ended with Navarre being partitioned into two territories; the king and his loyalists abandoned the south and moved to the northern part, now France. In 1525, Francis went to study in Paris. There he met Ingatius of Loyola, who became his faithful companion, and Pierre Favre. He seemed destined for academic success in the line of his noble family, but instead turned toward a life of Catholic missionary service. Together with Loyola and five others, he founded the Society of Jesus, the Jesuits. On August 15, 1534, in a small chapel in Montmartre, they made vows of poverty, chastity and obedience. They also vowed to convert the Muslims in the Middle East. Francis went with the rest of the members of the newly Papal approved Jesuit Order, to Venice to be ordained to the Priesthood. Towards the end of October, the seven companions reached Bologna, where they worked in the local hospital. After that, he served for a brief time as Ignatius’ secretary. St. Francis devoted much of his life to missions in Asia, after being appointed by King John III of Portugal to take charge as Apostolic Nuncio in India, where the king believed that Christian values were eroding among the people. After successive appeals to the Pope asking for missionaries for the East Indies, John III enthusiastically adviced the Rector of the College Sainte-Barbe, to draw newly graduated youngsters that would establish the Society of Jesus there. In 1540 Francis left Rome and took with him a breviary, a catechism and Latin book that had become popular in the counter-reform. The breviary and the book by Marulic accompanied Xavier on all of his voyages, and was used as source material for much of his preaching. St. Francis did missionary work in Goa, India, Indonesia, and Japan. In Malacca, Francis met a Japanese man named Anjiro. He heard of Francis and had traveled from Kagoshima to Malacca with the purpose of meeting with him. Having been charged with murder, Anjiro had fled to Japan. He told Francis extensively about his former life and the customs and culture of his beloved homeland. He helped Francis as a mediator and translator for the mission to Japan that now seemed much more possible. He told Francis the Japanese people would convert, but it would take some time. Anjiro became the first Japanese Christian and adopted the name of “Paulo de Santa Fe”. He returned to India in 1548, and the next 15 months were occupied with various journeys and administrative measures in India. Then due to un-Christian life and manners on the part of the Portuguese which impeded missionary work, he traveled from the South into East Asia. He left Goa in April 1549, and stopped in Malacca to visit. He was accompanied by Anjiro, and two other Japanese men. He had taken with him presents for the King of Japan, since he was intending to introduce himself as the Apostolic Nuncio. Francis reached Japan on July 27, 1549 with Anjiro, but he was not permitted to enter any port. He was not allowed to enter port with his ship until August 15, when he went ashore at Kagoshima, on the Island of Kyushu. As a representative of the Portuguese King, he was received in a friendly manner. Although he was given a friendly reception by Shimazu Takahisa, he forebade the conversion of his people to Christianity under penalty of death. Francis was the first Jesuit to go to Japan as a missionary. He brought with him paintings of the Madonna and the Madonna and Child. These paintings were used to help teach the Japanese about Christianity. There was a huge language barrier as Japanese was unlike other languages the missionaries had previously encountered. Artwork was the way Francis taught in Asia. For forty-five years the Jesuits were the only missionaries in Asia, but the Franciscans also began proselytizing in Asia as well. Christian missionaries were later forced into exile. Although Christianity was outlawed, it was kept underground, so they wouldn’t be persecuted. The Japanese people were not easily converted, many of the people were already Buddhist or Shinto. Francis tried to combat the disposition of some fo the Japanese that a God who had created everything, including evil, could not be good. The concept of Hell was also a struggle, they didn’t like the idea of their ancestors living in Hell. Xavier was welcomed by the Shingon Monks, since he used the word Dainichi, for the Christian God, attempting to adapt the concept to local traditions. As he learned more about the religious nuances of the word, he changed it to Deusu, from the Latin and Portuguese Deus. The monks later realized that he was preaching a rival religion, and grew aggressive towards his attempts at conversion. Japan could be considered somewhat fruitful as attested by congregations established in Hirado, Yamaguchi, and Bungo. Xavier worked more than two years in Japan and saw his successor Jesuit established. He then decided to turn to India. In late August, 1552, he reached the Island of Shangchuan, what is now known as Hong Kong. At this time, he was only accompanied by a Jesuit student, Alvaro Ferreira, a Chinese man called Antonion and a Malabar servant called Christopher. Around mid-November, he sent a letter saying that a man had agreed to take him to the mainland in exchange for a large sum of money. Having sent back Alvaro Ferreira, he remained alone with Antonio. He died at Shangchuan from a fever, on December 3, 1552, while he was waiting for a boat that would agree to take him to the mainland China. He was buried on the beach at Shangchuan Island. His Incorrupt body was taken from the island in February 1553, and was temporarily buried in St. Paul’s Church in Portuguese, Malacca. An open grave in the church now marks the place of Xavier’s burial. His body is now in the “Basilica of Bom Jesus”, in Goa. 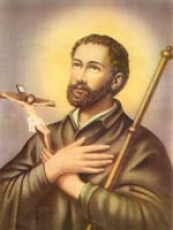 St. Francis Xavier is best known for his missionary work, both as an organizer and as a pioneer. He is said to have converted more people than anyone else has done since St. Paul. By his compromises in India with the Christians of St. Thomas, he developed the Jesuit missionary methods along lines that became a successful blueprint for his order to follow. His efforts left a significant impression upon the missionary history of India. His work was also noteworthy to Christians in the propagation of Christianity in China and Japan. India, to this day, has numerous Jesuit missions and many more schools because of this great saints work.